While we anxiously await the new trailer for Star Wars: The Force Awakens, which director J.J. Abrams said is coming this fall, there is still plenty of Star Wars material to keep fans occupied. During Force Friday last month, Disney and LucasFilm released a slew of new merchandise, along with a series of comic books and novels entitled Journey to Star Wars: The Force Awakens. Today, Yahoo! 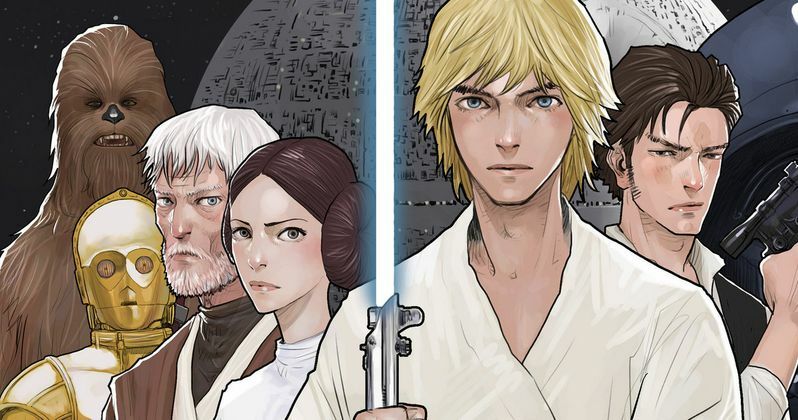 Movies has revealed a web comic from Korean artist Hong Jacga, which was created in collaboration with LucasFilm as part of the Star Wars canon, and offers new details about young Luke Skywalker. The first three issues of this web comic are currently available on WebToons.com, or through the site's apps which can be downloaded from iTunes and Google Play. New issues will debut every Thursday and Sunday. The web comics actually debuted in Korea back in April, with the comics slated to run until January 2016, but today marks the English-language debut of these comics, dubbed Star Wars: The Story Before The Force Awakens, which will explore events from the original trilogy. The first issue shows Luke Skywalker at just seven years old, who even then dreamed of escaping his desert home and his Uncle Owen and Aunt Beru. The comic presents a number of places, creatures, characters and details that Star Wars fans will be familiar with, including womp rats, Windy and Biggs, dewbacks and krayt dragons, Tosche Station and Beggar's Canyon. Here's what Hong Jacga had to say about revisiting Luke Skywalker as such a young boy. "The most difficult part of revisiting Luke was how I could present him as a round character, portray his fear and agony. I was troubled by the thought that I might portray him too flat... Fortunately, I was able to pull it through by including bits on his childhood and telling the story from his perspective. What better way to show complexity of a character than to have the readers directly experience the protagonist's development in his own eyes?" The comic also highlights Luke's first meeting with Obi-Wan Kenobi, which may remind fans of a scene from Star Wars: Episode IV - A New Hope. The comic shows Luke encountering a massive krayt dragon, when Obi-Wan Kenobi comes in and saves the day. In Star Wars: Episode IV - A New Hope, C-3PO walks past the massive skeletal remains of this very same dragon, but Hong Jacga wouldn't confirm if it was the same skeleton. "The beginning of the webtoon had to include the fact that Obi-Wan had been watching over Luke from a far during Luke's childhood, and I needed to keep the scene of their first encounter intense. I can't really say that the krayt dragon... is the same skeletal krayt dragon portrayed in A New Hope because no one knows exactly if there was only one krayt dragon on Tatooine during this period or if the skeletal krayt dragon in the movie had been dead for a very long period of time." You can visit WebToons.com to read the first three issues of this digital comic book. New issues will be available every Thursday and Sunday, giving fans even more material to pass the time until Star Wars: The Force Awakens hits theaters on December 18. Are you excited to learn more about Luke Skywalker's childhood?